If you have decided on the shape of your sticky label, please start below. If you need more inspiration, see other categories further down. Our cheap uncoated paper labels are perfect for a range of things, including cosmetic products, food and beverage products, pricing labels, and electrical services. Take an economical choice but take the classiness up a notch with a glossy finish. Like all our labels and stickers, they are available in all the sizes and shapes. Sometimes mistakes happen and an easy way to cover them up is using a blackout label that is made specifically to block out any text or pictures underneath. Choose us for a limitless variety. Add instant punch to your point of sale, promotional and marketing campaigns with Fluorescent paper labels from Handy Labels. Available in many shapes & sizes. Try our waterproof vinyl labels. Cut to any shape or any size you require. Many different finishes available to make your label unique. Waterproof and custom to your design and required shape. Our white glossy waterproof vinyl labels are very durable and will stay stuck under extreme wet conditions. All our prices include VAT and FREE DELIVERY as standard! Our affordable matt waterproof vinyl sticky labels give you a more luxurious look and feel to your finished label design. Custom built to your exact specifications. All our prices include VAT and FREE DELIVERY as standard! Our silver metallic vinyl labels look classy when combined with an attractive design and the quality shows. Order your labels in any shape and size, plus FREE DELIVERY! Our gold metallic sticky labels give the impression of high quality without the high cost! Order your sticky labels in any shape and size, plus FREE DELIVERY! Our discount clear glossy vinyl labels are a great way to achieve the ‘no label’ look. Buy online instantly in any shape and size, plus FREE DELIVERY as standard! We can produce any size and shape possible in our clear matt vinyl label range, add a touch of style to your products. Buy any shape and size, plus FREE DELIVERY as standard! Our cheap glossy laminated vinyl labels are the perfect choice if you require a durable sticky label that can be wiped clean. Plus all our prices include FREE DELIVERY! Our discount matt laminated vinyl labels are the choice of material if you require a sticky label that is scratch resistant. Plus all our prices include FREE DELIVERY! Our highly visible window stickers are perfect for all smooth glass surfaces, car windscreens and retail window displays. Buy any shape and size, plus FREE DELIVERY! Our clear window stickers are perfect for all smooth glass surfaces, car windscreens and retail window displays. Buy any shape and size, plus FREE DELIVERY! Correction vinyl labels - also known as block-out labels - are a great cost-effective way of fixing errors on printed material. All our prices include FREE DELIVERY! If you want your messages and promotions to stand out, then our cheap fluorescent vinyl labels are the perfect choice. All our prices include FREE DELIVERY! Our Crystal Frost labels are perfect if you want something a bit different. Combined with the right design, the sparkly finish really makes this label stand out. Because it's so rare, gold is high in value so it gives products an expensive, quality perception when used in the packaging. Take advantage of this with our stickers and labels. The brushed silver coating on these labels really catches the eye, giving your brand and products a prestigious look. Brushed steel, brushed aluminium or brushed silver can all mean similar things, it depends on your point of view but what's not up for debate is that our labels are the best. All our prices include VAT and FREE DELIVERY! Popular for accreditation and certification badges, polished gold labels are good if you want to assure customers of your credibility, longevity and success. Our stunning polished silver vinyl labels will really showcase the quality of your products, materials or service. Steel or chrome look in any design and shape. Personalise products with your brand identity and create an impact with our product labels. Choose from our popular categories below. Candle making is a growing hobby and some turn it into a business. Finish your creation off with a custom made label. 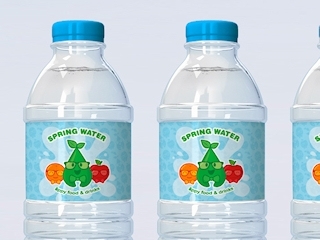 Personalised water bottle labels are a great way of promoting your brand, and our bottle labels come in a vast array of sizes and shapes, plus FREE DELIVERY as standard! Design your own labels for your products and we’ll print them. 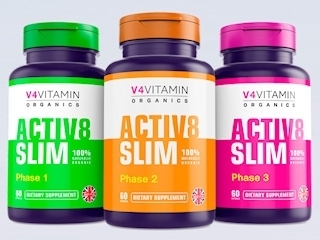 Ideal for vitamins, supplements as well as homeopathic and other remedies. 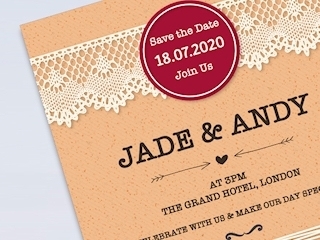 Add the personal touch to your wedding plans. All sizes, shapes and finishes made to measure for favours, thank you cards and more, multiple designs in one order. 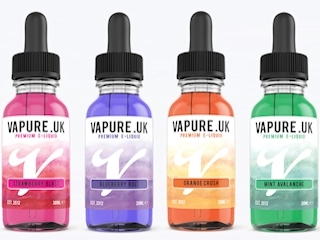 Come to Handy Labels for all your vape liquid refill labels and stickers for bottles containing e-liquid for electronic cigarettes. We make custom labels for soap and personal care products. 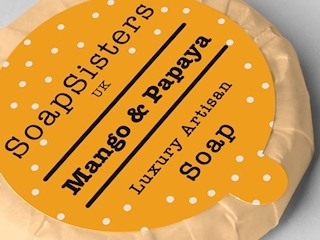 Soap making can be a great little business or a hobby, here are some labelling options. 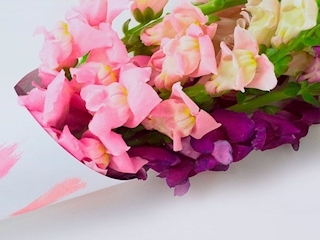 Made a beautiful flower arrangement? Make sure it’s not just the person who bought it who knows it was your talent that created it. Very popular with eBay traders, online shops and mail order businesses to brand their goods, our address labels are perfect deliveries. Don't forget our FREE DELIVERY! Barcode labels are one of the most widely used label types. If you need additional info on your products, barcode labels are the perfect solution. FREE DELIVERY as standard! Toiletries, perfumes, cosmetics and personal care products are being innovated by smaller concerns outside of the bulk brands. We applaud this and supply labels in quantities to suit. Plus don't miss out on FREE DELIVERY as standard! Create great looking packaging for great tasting food with our food and beverage labels! Available in self adhesive paper, waterproof vinyl or metallic vinyl. Health and safety is increasingly becoming part of your business world, increase awareness of any potential dangers with a well placed sticker in any colour and design. QR code labels are brilliant if you are looking for an interactive label - add URLs, contact details or geo tracking to your marketing. FREE DELIVERY as standard! Quality control labels are useful for ensuring administrative tasks are being carried out and are accurately met time after time. We offer FREE DELIVERY as standard! We stock the largest range of removable label shapes and sizes available to instantly buy online! Not only that, our prices include VAT and FREE DELIVERY as standard! We understand price labels need to be eye catching and well designed to achieve maximum results, so choose our retail price labels! Plus FREE DELIVERY as standard! Sequentially numbered or consecutively numbered labels are used mainly to identify and track valuable assets in the workplace. Plus FREE DELIVERY as standard! Small to medium volume production runs from micro breweries and distilleries are becoming more and more popular, catch the eye with a unique label. Holographic stickers and labels are used in a myriad of applications such as security tabs and simply to catch your eye. Order yours online today, small runs accepted. All our prices include VAT and FREE DELIVERY as standard! Popular with online shops and businesses to brand their goods, our easy peel and stick return address labels are perfect for deliveries. FREE DELIVERY as standard! Looking for a unique label? Our resin domed labels stand out above the rest with a crystal clear resin dome to give a superior finish. FREE DELIVERY as standard! Our paper labels are perfect for a range of uses including beauty products, food products and electrical services. All our prices include VAT and FREE DELIVERY! Waterproof labels and stickers are excellent if you need something durable that can be wiped cleaned. All our prices include VAT and FREE DELIVERY! When you have an application for a label or sticker that requires durability beyond your average material, take the already robust vinyl and laminate it - almost indestructible. Our day glow fluorescent labels add instant punch to your marketing campaigns and are available in green, orange, pink, red or yellow. FREE DELIVERY as standard! Mistakes are always a possibility and change is inevitable, cover the evidence with a correction label or sticker. Available in materials to suit and blend in seamlessly. Window stickers are a great way to get your message across and are ideal for glass surfaces, car windscreens and retail displays. Plus FREE DELIVERY as standard! Metallic sticky labels are popular for gift packaging and special occasions. Try our online label design tool! All our prices include VAT and FREE DELIVERY! Whilst they may seem like a simple thing, labels and stickers are more than just a combination of paper and glue. They are a way to reward, a way to notify and a way to advertise! Another great thing about our printed labels, in particular, is that they come in an infinite range of different shapes, sizes, colours, designs and they can be supplied in almost any material imaginable. Our customers have used our products for many uses, lip balm and cosmetic labels are popular as well as own label stickers for many applications. Not sure which type of branded printed labels is right for you? We have put together our comprehensive guide to help you through it and remember if you want a custom design, you can have any shape you want! Whether you are looking for custom printed labels on sheets or business stickers to promote your company, we have just the custom sticker that you’re looking for. Custom branded wine and beer labels are also common orders that we fulfil in large or small runs to suit any pocket. Whatever stage of the design process you are, choosing the shape is normally the first port of call. The good news is, there is no restriction whatsoever. There are several template shapes but there’s nothing holding you back. Here are some of the common label template shapes that we can offer and their potential uses. Round self-adhesive stickers are one of the most popular shaped labels to use. The round symmetry lends itself to many uses. Items for sale, bottle labels, cosmetics and lip balm labels, logo prints and they’re also ideal for those who want to use them as price stickers, sealing gifts or as a reward on a sticker chart for children. Round labels come in a variety of sizes, this can range from as small as 10mm in diameter right up to stickers that are as large as a wall mural! Square labels, much like round ones have a variety of uses. You may find them used on cosmetic labels or perhaps to list ingredients found in a ready meal. 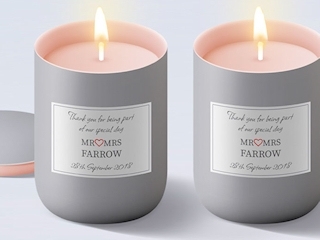 Square labels are a popular choice for new promotions or perhaps to label envelopes with addresses or for candle labels. Here at Handy Labels, we are able to provide a minimum order of just 25 labels, perfect to test a product idea. Whilst the idea of a rectangle sticker is much the same as a square, the larger area on these stickers allow for them to be wrapped around items such as bottles or other food products. So rectangle stickers are popular for those who are looking to label food containers, however, they still work fantastically for promotional matters and even ideal for window stickers too! A rectangular sticker is great for making sure that you not only fit in more text, perfect for an ingredient list or to ensure a business slogan is a key feature. Sometimes only your own shape will do. Food and beverage labels are great when custom made. Cleaning products often have custom, personalised stickers which define each of them from one another. They can also be used for study materials, using a differently shaped sticker for separate subjects and sub-categories. Custom shape labels are only available in our waterproof vinyl range of materials. The Materials We Print Your Labels On. Choose high-gloss, photo quality for crisp images or silky, soft matt for elegance. From metallic to fluorescent, different materials give very different results. The label material that you chose will largely depend on the end result you’re looking to achieve and what you want to use it for. A great all-rounder, often seen on beauty and cosmetic products, food and beverage, electrical goods and almost anything. Available in a huge range of shapes and sizes, we’re sure you’ll find what you’re looking for. Being our most cost-effective choice of label material makes it a real winner! Not only great for all the same uses as uncoated paper, but you can also use glossy paper labels for bottles and jars. However, it’s recommended you don’t use these labels for any products that are likely to be stored in water or in ice such as glass beverage bottles as the paper is likely to fray. For these items, we suggest you opt for white glossy vinyl stickers instead. They are the ideal choice for glass bottles, as well as plastic containers, due to their waterproof qualities. Ideal for products that will be outside in the elements too. Waterproof vinyl also comes in a variety of other finishes, not just white. Here at Handy Labels, we are proud to offer a wide variety of waterproof vinyl stickers that you can choose from! This includes clear glossy vinyl, which is great if you are affixing it to a see-through product such as a bottle sticker to achieve a ‘no label look’. You can also opt for metallic vinyl or crystal frost vinyl. Both of which are ideal for those who are looking to make for a luxurious and glamorous product that will appeal to a premium or prestige market. The majority of our labels come with three different types of adhesive. Removable, Permanent and Extra Permanent also know as High-Tack. The type of adhesive that you opt for will really depend on what you are using your particular labels for. Removable labels are easy to peel off. These are often the types of labels that are used to price a product. For example, A book cover that requires a price sticker which then needs to be removed not leaving a sticky residue or not damaging the surface of the product. Permanent labels are harder to peel than removable labels (yet are still not entirely impossible to take off). A Permanent adhesive is by far the most popular choice, as it’s level of adhesion suits the majority of uses. For a more permanent option for your product, choose an extra permanent label. They are often recommended for glass jars and bottles… particularly if they are likely for beer bottles to be placed in water or ice and is the label of choice for those who run a bar or nightclub. The only adhesive choice if you require your personalised label to stay stuck on a low energy surface, for example, any type of plastic. They are, however, less likely to be used if you’re looking for a way to seal a package or product as this could prove frustrating for the end user! Now that you know more about the range of Handy Labels products and how they may be suited to your needs, why not try a free sample pack and see if they work for you?! Already sure which one is for you? Start ordering your labels now using our interactive online store and see if you can label up your products with our discount labels and discount stickers!